WOODINVILLE, Wash. – Ted Baseler, who led Ste. Michelle Wine Estates through a period of tremendous growth, announced his retirement on Wednesday, Aug. 22, ending a 34-year career with the company, including the last 17 as its president and CEO. Baseler, 64, started with the winery in 1984, when Allen Shoup hired him as director of marketing. 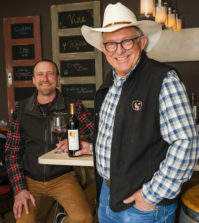 “We lost $3 million that first year, so I thought this will be a short gig,” he told Great Northwest Wine with a laugh. Since taking over as CEO in 2000, the company has grown from $21 million in operating income to $146 million last year, growth of 12.1 percent annually. During the same period, company case production has grown from 2.8 million cases in 2000 to 8.5 million last year. 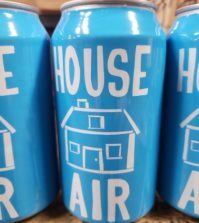 Some of this growth comes from building brands such as 14 Hands, Seven Falls, Intrinsic Wine Co., and Bourn of Fire as well as through acquisitions. Ste. Michelle Wine Estates ranked No. 8 in the U.S. on Wine Business Monthly magazine’s 2018 list of wineries by volume. Bronco Wine Co., was seventh at 9 million cases. E. & J. Gallo is No. 1 at 70 million cases. Ste. 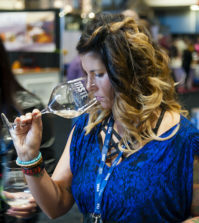 Michelle bought Oregon’s Erath Winery in 2006, growing one of the state’s first wineries from 50,000 cases to more than 300,000. The company jumped onto the world wine stage in 2007 when it bought Napa Valley’s Stag’s Leap Wine Cellars, whose 1973 Cabernet Sauvignon won the historic Judgment of Paris tasting in 1976, an event that propelled the U.S. wine industry while also shocking the French industry. Ste. Michelle acquired Stag’s Leap with the Antinori family of Italy, which also partners with Ste. Michelle on Col Solare, a premium winery on Red Mountain. Baseler also forged deals with wineries in France, Germany, Spain and New Zealand to help broaden the companies portfolio as well as its footprint on the world stage. That global position was solidified in 2009 when the Columbia Crest 2005 Reserve Cabernet Sauvignon was ranked No. 1 in the world by Wine Spectator magazine. Two years ago, Ste. Michelle purchased Patz & Hall, a highly respected producer of Pinot Noir and Chardonnay in Sonoma County. Baseler was born and raised in Oregon, moving to Bellevue during his teen years, graduating from Interlake High School. 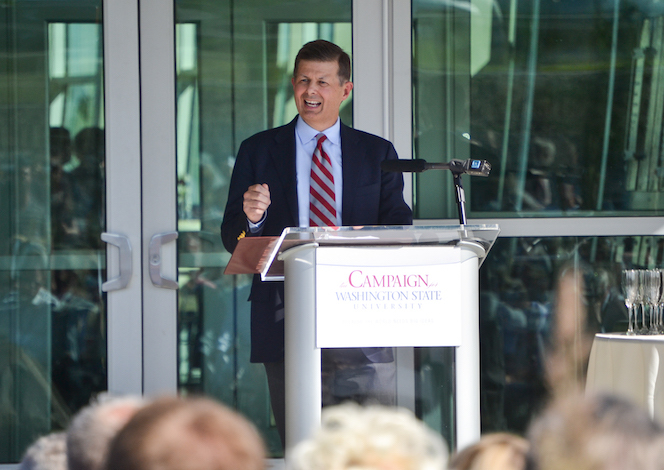 A proud graduate of Washington State University, he stepped up to help raise $23 million to build the WSU Wine Science Center in Richland, which opened in 2015. The research center already is paying dividends as it helps growers and winemakers deal with smoke taint that has been an issue the past two vintages. 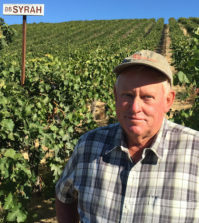 Baseler’s last day as CEO is Oct. 1, which will be about the midway point of wine grape harvest, which began Friday, Aug. 17, when when the first load of Sauvignon Blanc arrived at the winery. 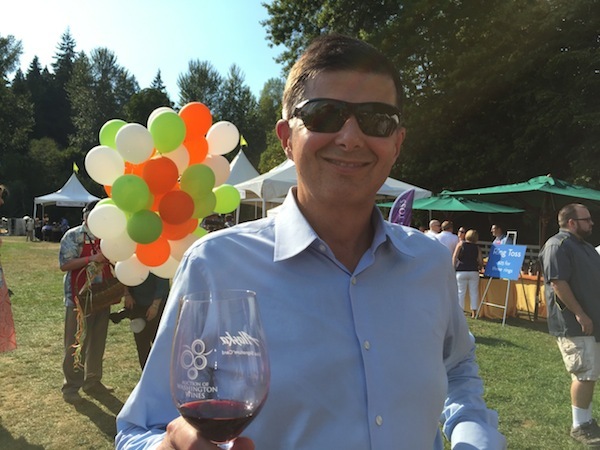 Baseler will remain in place as a company consultant, working with suppliers, strategic partnerships and charitable events, including the Auction of Washington Wines, which raised $4 million over the weekend. Jim Mortensen, a senior VP of HR for Phillip Morris, has been named Baseler’s replacement. Ste. Michelle is owned by the Altria Group, formerly Phillip Morris. Shares of Altria on the New York Stock Exchange were off 1 percent on Wednesday, falling to 59.32. Baseler says he plans to stay in the Seattle area, where he plans to work on his golf game and skiing, and perhaps get in some fly fishing. 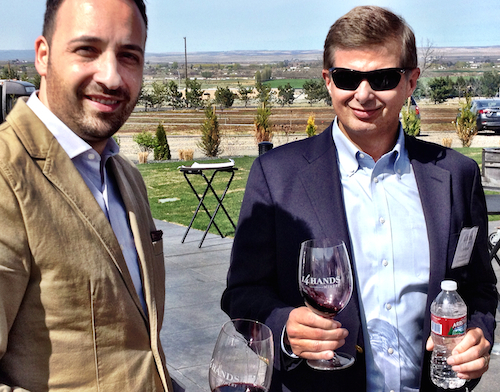 He remains both a WSU regent and on the board for the Auction of Washington Wines. Great job, well done. I had worked for Eber Bros. in NYC. You were the best to us.